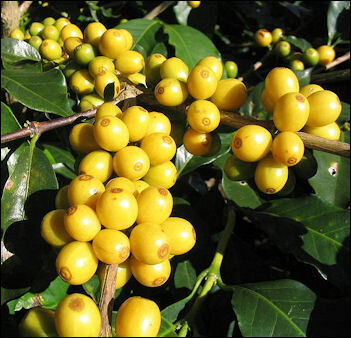 The coffee plant is a perennial tropical evergreen belonging to the genus Coffea in the family Rubiaceae . Although there are at least 60 plants in the genus, only three are harvested commercially: arabica, robusta and to a much lesser extent libeca . There are over 150 Hybrids of these plants that have also been developed. The most significant are grouped under Arabica, since this is a more marketable name. Most bags of Arabica are actually a combination of at least 3 hybrids, and it is very rare to find a single varietal unless it is a microlot coffee. 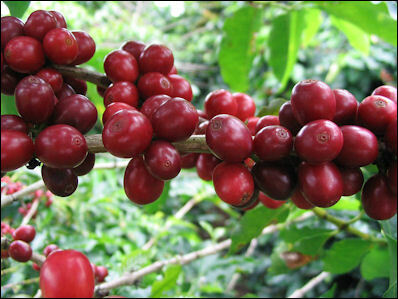 The coffee bean comes from the cherry or berry of the coffee plant which is actually plant’s fruit. It is produced after the withering of a white flower. Typically each cherry consists of two seeds (beans) surrounded by pulp and skin, there are hybrids that produce a single sead, this is than called a peaberry. Also when processing there are incompletely formed beans that will be graded as peaberry. The cherries are green at first and turn red when they are ripe. They take six to 14 months to ripen, depending on the species of tree. Coffee is cultivated in many places in tropical Latin America, Asia and Africa between the Tropic of Cancer and the Tropic of Capricorn. It grows best in places with rich soil, reliable rainfall and altitudes between 3000 and 6000 feet. As a rule, the higher the elevation the coffee is grown the better the quality. Cold weather and frosts can seriously damage a coffee crop. Coffee grown above 3,937 feet is considered to be the best quality. Arabicas grow best in shady areas at elevations above 3,000 feet in climates with an average temperature between 18° and 25°C the entire year, and a low of 13°C and with rain between 40 and 90 inches a year. They are often grown on slopes of mountains or hills and shaded and protected wind damage by banana palms, orange, mango, mahogany, or rosewood trees or other large trees. Robusta beans grow better in the open sun. They are often mass produced in plantations where they are chemically fertilized and grow fast. Robusta trees reach their peak at age 7 and can keep producing until they are 18. A total of 25 million farming families in 60 countries depend on coffee for their livelihood. About 70 percent of the world’s coffee is grown by 7 million farmers on farms on than less than 5 hectares (12 acres) of land. Much of the work is still done by hand. Because higher quality coffee is raised on mountain sides and in forest it can not be planted and harvested with large machines like corn or wheat, which are grow on flat areas and are harvested with the entire plant being cut down, this is not true for the Robusta plantations and some of the low quality Arabicas which are mechanically planted and harvested, especially in countries like Brazil and Vietnam. Coffee bushes take years to reach peak production, which means that growers need to make an initial investment and wait. These days much of the world’s coffee comes from high-yield robusta plants that grow well in sunny conditions, actually 40% of the worlds production is Robusta, so much is not the correct word. This has had a harmful effect on the environment by depriving wildlife of trees to live in. In many places subsistence farmers are being driven off their land and are being replaced by sharecroppers. Arabicas tend to be grown on small farms. A 45-year-old third generation coffee farmer told Smithsonian magazine, “It’s a craftsman job. You’ve got to love it every day.” To produce a good quality crops, he said, requires 32 steps, including understanding the soil, choosing the right beans, cultivating plants in nurseries and giving different mixtures of compost made of coffee ground, cow manure and farm wastes to the coffee plants at different stages of their development. “When they are producing fruit, you must treat them with more respect, just as if they were a mother,” he said. Typically harvesting is labour intensive work, with the cherries being picked mostly by hand. The cherries ripen at different times and are ideally picked only when they are ripe, for some varietals this is not the case, and also in countries like Brazil and Vietnam varietals are chosen to specially mature within a 3 week period, so that they can be mechanically harveste . In some places all the cherries on a plant are picked, regardless of ripeness. In other places selective picking is done, the best coffees require this and all coffees that are sold direct before auction are typically only picked when ripe otherwise they end up at the large auction houses. An average worker can pick 100 to 125 pounds a day. Mechanical pickers have been invented but they offer poor results because they yields a mixture or ripe and unripe beans, Scientist are working in a genetically modified coffee with beans that stop short of ripening and then are all ripened at the same time with a chemical spray. Problems encountered by coffee cultivators include coffee leaf rust and the berry borer, Columbia, this is one of the main drivers around the hybrid and genetic development, and also why some countries now specialize in Robusta which does not suffer from the Coffee Rust problem. It is a shame to see areas like Indonesia converting almost all their Arabica plantations to Robusta over the last 150 years, in fact in Indonesia (the place that gave us the word Java) only 30% of the crop is Arabica now. Biotechnology has produced decaffeinated coffee beans. Many coffee growers don’t want these plants anywhere near their plants. 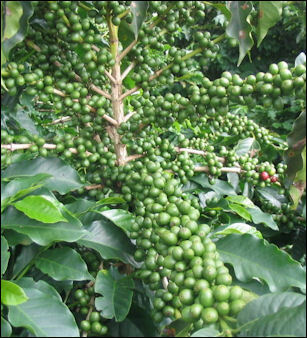 In recent years there has been an effort to bring back Arabica agriculture. In the 1960s, most coffee was Arabicas grown in the shade of rain forest trees. Arabica coffees are relatively environmentally-friendly crops. It was traditionally grown under a canopy of rain forest shade trees amid other kinds of vegetation. The trees and plants fixed nitrogen in the soil and their leaves provided nutrients. Few chemical were used and the lush vegetation prevented erosion and provided a habitat for wildlife. In the 1960s and 1970s Arabica crops were devastated by the coffee leaf rust, not for the first time it has been happening since the 1780s on a mass scale, and is worse in plantations that grow coffee trees in environments that are not bio-diverse. These days much (as I have already stated 40%) of the coffee grown are high-yield Robustas that grow well in open in sunny fields and were introduced to stop the spread of coffee leaf rust.. Robusta production requires large amounts of fertilizer and pesticides and has resulted in trees being chopped down and rivers and groundwater contaminated with chemicals from pesticides and fertilizers. Millions of hectares of rain forests and cloud forests have been cleared, this is dependent on the country of origin, most of the Africa, Indonesian, India and Central Amercia coffee this is not the case. 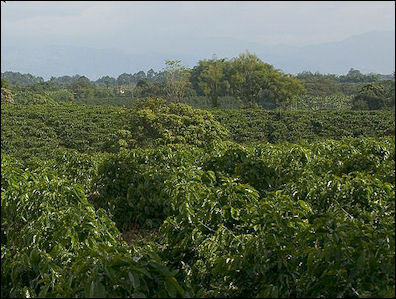 Much of the land in the 25 highly threatened biodiversity hot spots designated by Conservation International are in or around coffee-growing areas. One study found that coffee plantations located near fragments of forests boosted their income because of the presence of pollinating bees. The coffee genome was cracked after two years at an expense of $2 million. The Nara Institute of Science and Technology in Japan has developed genetically-engineered plants that produce coffee beans with 60 percent less caffeine. 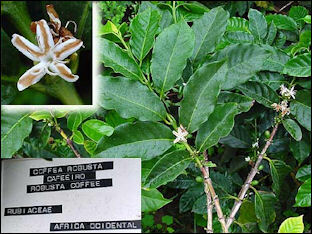 Many coffee growers don’t want these plants anywhere near their plants. Coffee beans being sorted and pulped Coffee is the world’s largest traded commodity after crude oil and creates jobs for 10 millions people, many of them in poor countries, this fact has been discredited, it included all workers including waiters that served coffee, also coffee is the second most actively traded commodity behind oil, that means that the futures market is the most actively traded behind oil, in fact coffee is barely in the top 50 of traded commodities, with the wheat and beef industry being MUCH larger. Global revenues from coffee sales are around $55 billion, compared to $30 billion in the 1990s. Coffee is sold on the world market at commodity exchanges along with other agricultural products, about 8% of the coffee market is now sold direct, and this number is growing. There commodity market still accounts for most of the sales but this growth in direct selling has resulted in better coffees, and more money getting to the grower and processor. The benchmark robusta beans price per ton is the standard price for coffee, actually that is way wrong it is the benchmark for Robusta coffee, the largest trading market for Robusta is the LSE, the largest trading market for Arabica is the NYSE, so typically London controls the worldwide commodity coffee future for Robusta, and New York control the worldwide commodity coffee future price (called C’Market price) . The coffee futures market is popular with speculators, hence its activity being so high. The coffee market is controlled, I believe that is not the correct word, dominated may be a better word, by the four big coffee roasters: Sara Lee, Nestle, Proctor & Gamble and Kraft, which is part of Philip Morris International. Market share in 2002: Philip Morris (25 percent), I could not find this fact anywhere, and believe it is closer to 7%; Nestle (24 percent); Sara Lee (7 percent), Proctor & Gamble (7 percent), Tchibo (6 percent); Other (31 percent). Starbucks only accounts for 1 percent of all coffee sales. For coffee sold via the C’market about 10 percent of the profits from coffee sales go to growers; 10 percent to exporters, 55 percent to shippers and roasters and 25 percent to retailers, when looking at the whole bean prices, not the finished product, the coffee brewers or coffee shops typically mark up at least 300% on the coffee they purchase. In early 1990s, people in the coffee-producing countries earned about 40 cents on every dollar spent on coffee. Now they only earn about 8 to 13 cents. The difference is attributed mainly to low coffee prices paid to farmers and the high prices paid by consumers, this was specifically the case then, when the C’Market was at its lowest in 50 years, last year the C’market was the highest it has been since the 60’s and no figures have been stated. 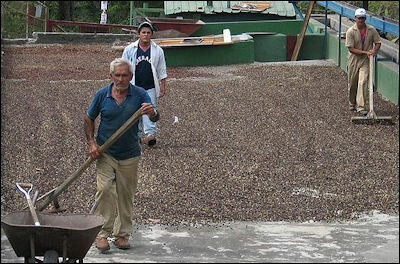 Also with the direct market growing more and more farmers, specifically in Central America are employing agents to sell direct to roasters and green bean importers, resulting in higher prices per kilogram or pound, the coffee we at Quaffee source, for every dollar the coffee costs about 35 cents goes to the grower, and the other 65 cents a split up between importer, agent and roaster. At the roasting factory, the coffee beans lose weight as the are ground and processed into brewing coffee or instant coffee. In the case of instant coffee, a kilogram of coffee that was bought for 63 cents is reduced in weight to 385 grams and sells for $1.64. The roaster processes, packages, distributes and markets the coffee and sells it a wholesale price to supermarkets for around $13.40 a kilo. Consumers but it at the retail price of $26.40 a kilogram, or 7000 percent more than what the farmer is paid. For a $3.75 double cappuccino sold at a coffee shop in the United States, 3.5 cents goes to coffee growers, 17.5 cents goes to coffee millers, exporters, importers and roasters, 40 cents covers the cost of the milk, 7 cents covers the cost of the cup, $1.35 pays the labor costs at the coffee shop, $1.29 covers the shop rent, marketing and general administration, 18 cents goes towards the initial investment, and 25 cents is the profit earned by the shop owner. Rising demand for coffee in China has created rising demand for coffee production world wide. Starbucks buys about 2 percent of the world’s coffee, a contridiction to a fact they stated above, which was 1%. read more at the link above, there is a significant amount of facts repeated so I have deleted the rest.